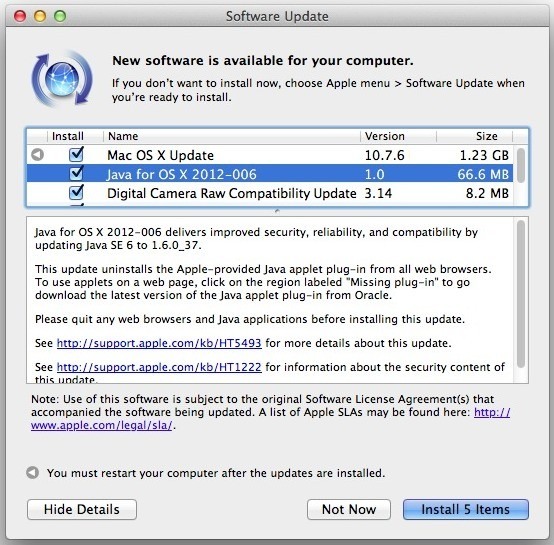 A new update labeled Java for OS X 2012-006 has been released for all versions of Mac OS X. The updates name is somewhat misleading however, in that instead of updating Java it actually uninstalls the Java applet plugin from all web browsers on the Mac. This is done as a security precaution to protect against potential malware, which has consistently used Java exploits as a means of attack. With Java removed from the browser (but not the OS), it forces Mac users to download the absolute newest version of Java directly from Oracle if the plugin is needed. 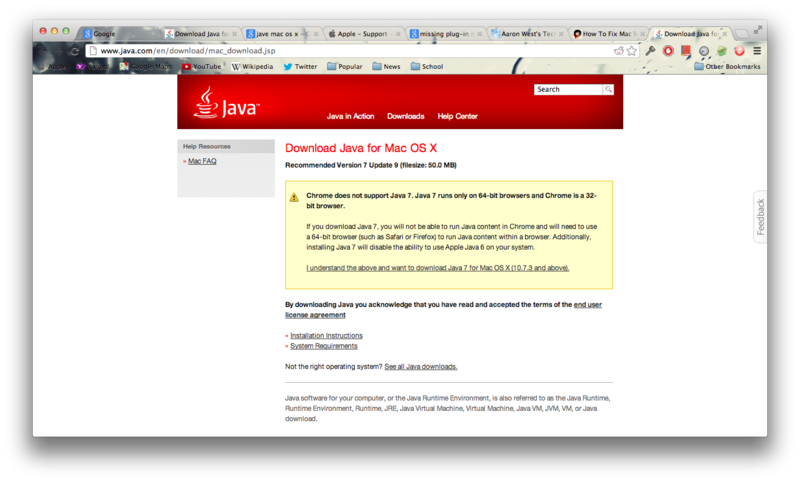 Installing the update removes will cause a “Missing Plugin” alert to appear if you visit a webpage that requires Java. In turn, that will direct you to Oracle to download the newest version of Java. If you don’t find the update available on your Mac, it means you either uninstalled Java already, or you never installed it to begin with. Ignoring or hiding the update is also possible, though the security benefits of going through with it are strong. For those that install the update but need Java to access certain websites, download the newest version of Java and then disable it on a per-browser basis, or even system-wide when it’s not needed. Strange however, why does an ‘uninstall’ requires 66.6 ;o) MB? After installing the update, there isn’t a ‘Java Preferences’ app anymore, so is very difficult to (temporarily) disable Java for the whole system. AFAIK, Java only can be disabled in the security settings of the browser. If you look at the snap shot there is a Mac OS X update 10.7.6 is this correct? In the snapshot there is a MAC OS X update with version 10.7.6 is this true? after the install (replacing the symbolic link), you can get the browser plug-in capability without having to consult the oracle. …, or even system-wide when it’s not needed. I HEAVILY suggest you do not download this “update” if you are a Chrome user. Chrome for OSX runs in 64-bit, and after removing Java and being pointed to the Oracle website, I learned that their version of Java would not support my browser and would in turn force me to use either Safari or Firefox (both 32-bit browsers). If you already did however install it, the previous Java version, 2012_005 restores the browser support and is available in the Apple Dev. Center. I think you have et reversed. Chrome runs in 32 bit on OSX whereas both Safari and Firefox runs in 64 bit. I decided not to upgrade to keep Chrome working with Java until a 64 bit version is released. So the idea is to force the users to the newest version of Java, but you still recommend to disable even the newest version of Java. So.. if installing the newest version is still not secure enough, what’s the point of the whole hassle? The update uninstalls Java. They suggest installing the newest version but disabling it most browsers until you need it. Makes sense to me. Java is the new Flash. Buggy, slow, and vulnerable to attack. I installed the update, but somehow the Java icon in the system preferences was still present, perhaps because I didn’t reboot, so I opened the Java control panel and updated Java from there. Now I have Java 7 update 9, which is the latest. After installing java-update-2012-006 i could not submit my iOS apps to AppStore anymore. I had Oracle’s Java 7 installed and Apple’s Application Loader (which is used to upload the app’s binary to iTunesConnect if I understand correctly) crashed. It took me an hour or so to uninstall Oracle’s Java, after doing that I was able to upload my app, but the experience was frustrating. after install java 7 (on mac os x 10.7.5), I lost my nice “smooth font” in the java game (yahoo and pogo)… can someone tell me how can set it? I have no global setting for Java after the update but my Logitech Harmony Remote software continues to work and it relies on Java. I have lost complete control of Java and have Java files all over the place. Yikes! If you guys can’t figure this out, how can I, a simple, ungeekified boomer? When I get a pop-up asking if I will allow Java to upload a new thingamajig, I say Yes, allow, and then it doesn’t — saying it couldn’t find some other thingamajigs to make it so. After reading all these posts, I am ready to throw the whole computer out the window. yes, I am a Window 7 user. Sigh. Is this all really worth it? Both Mac OS X Lion and Mountain Lion. After java-update-2012-006 Java preferences disappears. I have been to heaven, back and all over apple,oracle&google. I simply cannot find a simple way to bring back Java preferences. Is there a simple method to restore Java Preferences ??? for Lion and Mountain Lion ??? It was removed because Apple believes you can use the (new) JAVA preference pane in your System Preferences to do this job now, but this is not the case. I Googled around and found a link. After the install you find your Java Preferences.app in its old place, allowing you to switch between all installed JAVA versions and allowing your Browsers to use applets again. In the image in this article at the top, suggested there is a OS X 10.7.6! Was that only for developers? or is apple going to dish out a final 10.7.6 update for lion users? OS X 10.9.1 is the most recent version of OS X, it is much more stable than OS X Lion and highly recommended.